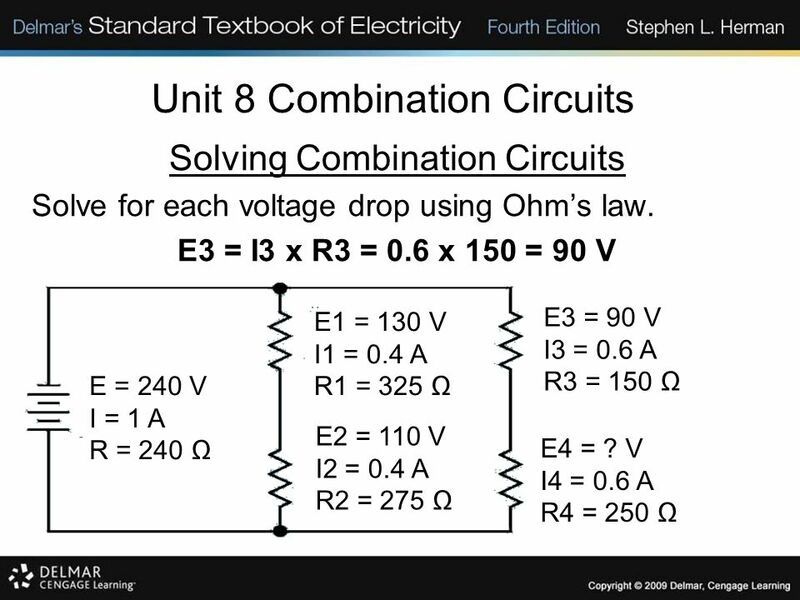 Objectives: Define a combination circuit. 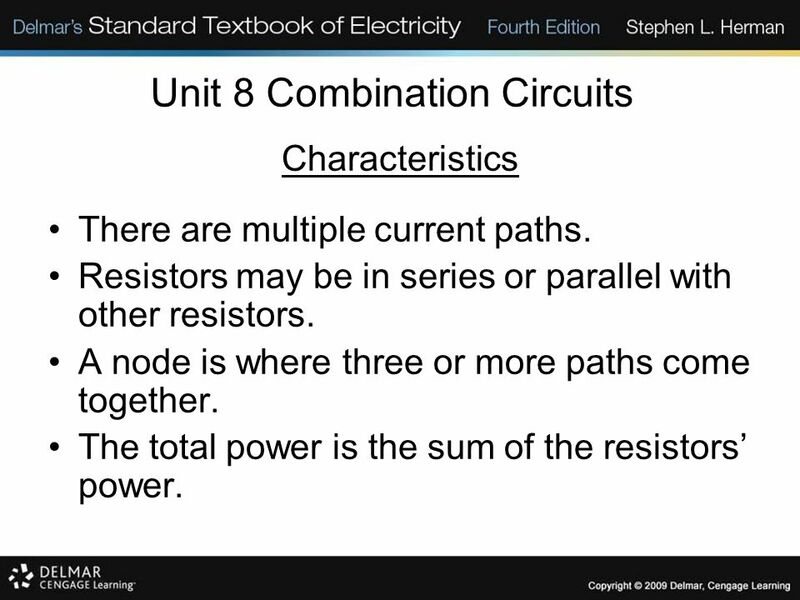 List the rules for parallel circuits. 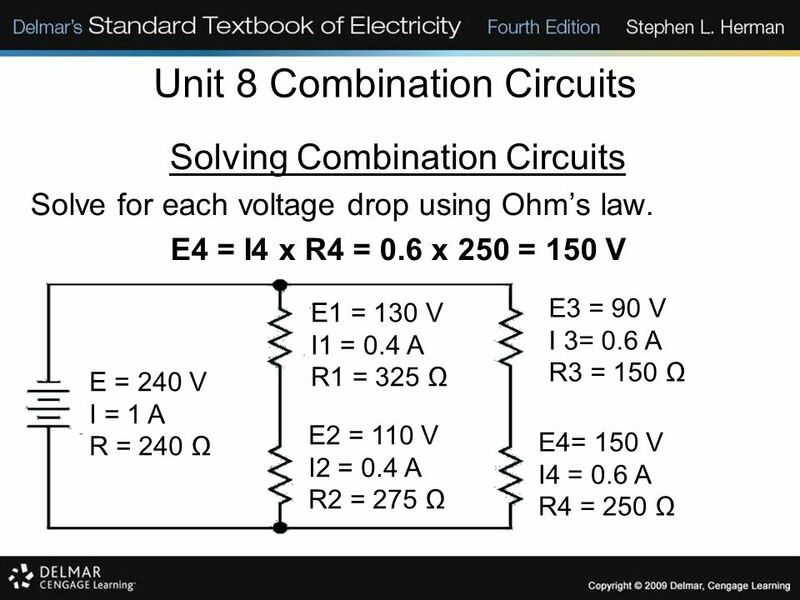 List the rules for series circuits. 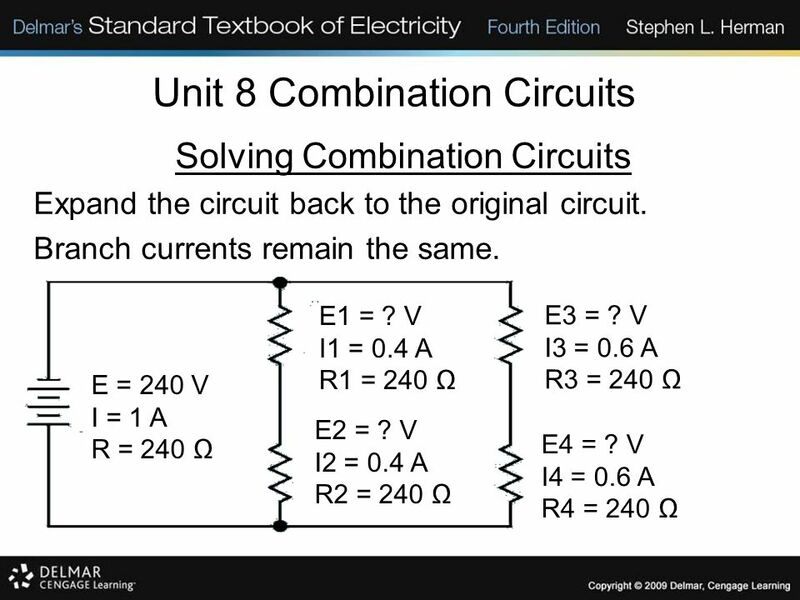 Solve for combination circuit values. Characteristics There are multiple current paths. Resistors may be in series or parallel with other resistors. A node is where three or more paths come together. The total power is the sum of the resistors’ power. 8-1 A simple combination circuit. 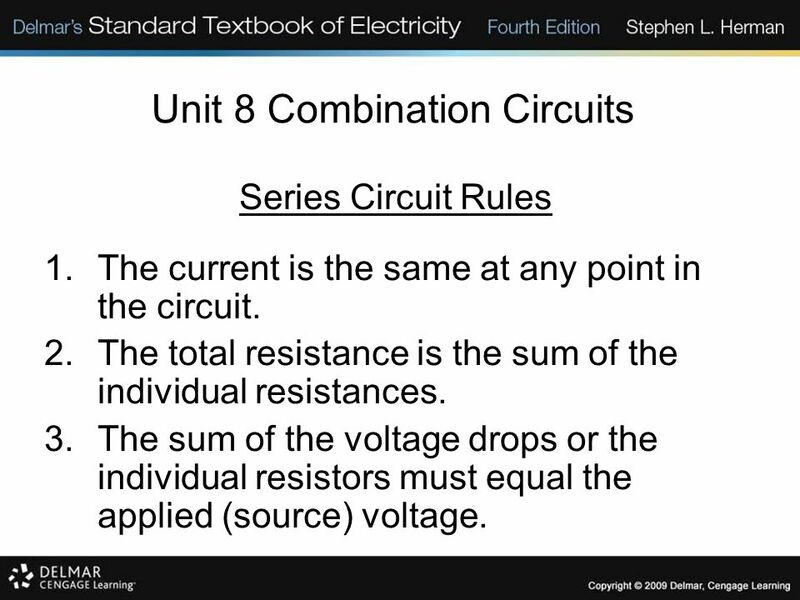 Series Circuit Rules The current is the same at any point in the circuit. The total resistance is the sum of the individual resistances. The sum of the voltage drops or the individual resistors must equal the applied (source) voltage. 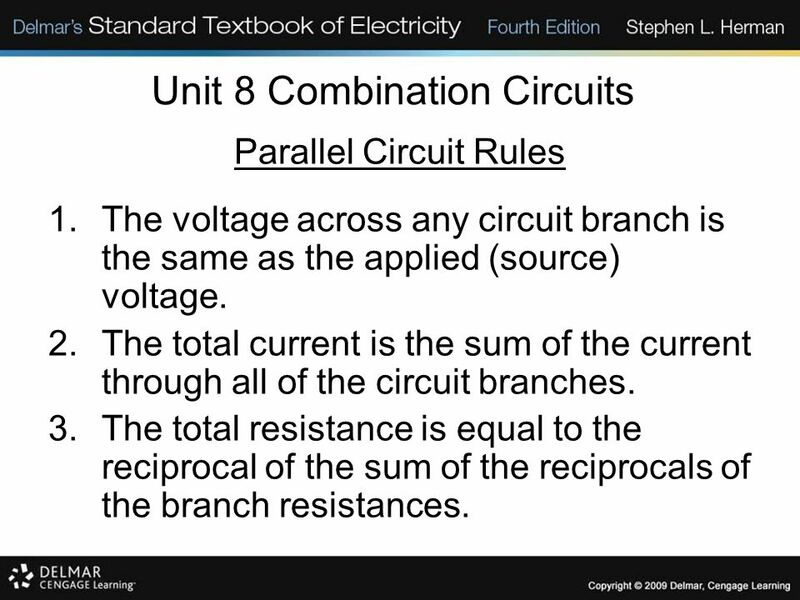 Parallel Circuit Rules The voltage across any circuit branch is the same as the applied (source) voltage. 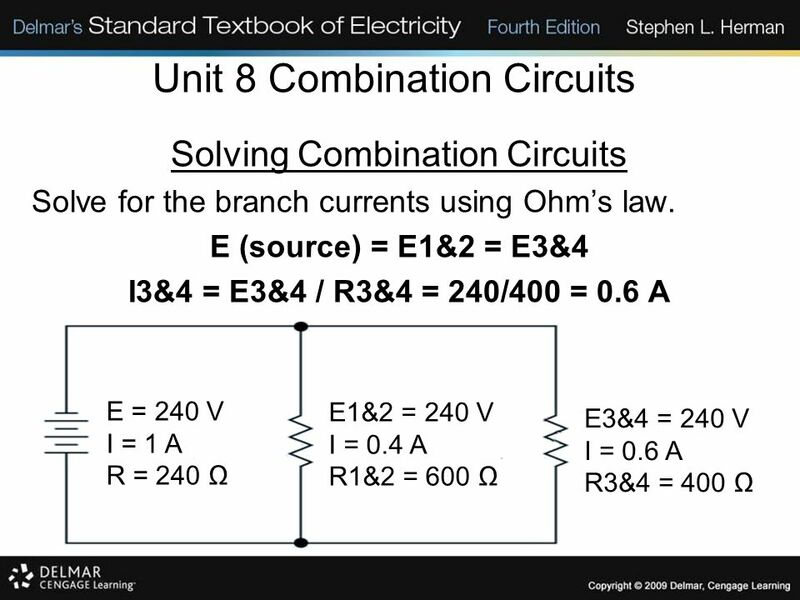 The total current is the sum of the current through all of the circuit branches. The total resistance is equal to the reciprocal of the sum of the reciprocals of the branch resistances. 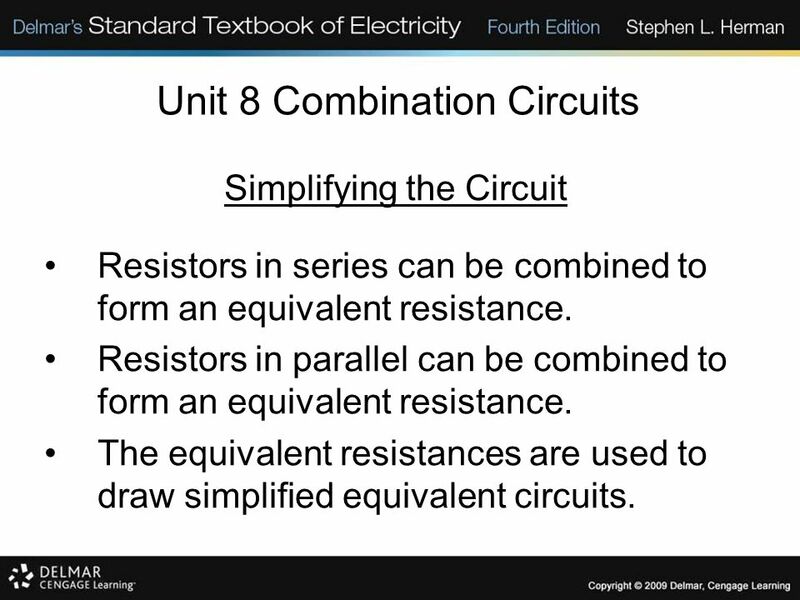 Simplifying the Circuit Resistors in series can be combined to form an equivalent resistance. Resistors in parallel can be combined to form an equivalent resistance. The equivalent resistances are used to draw simplified equivalent circuits. 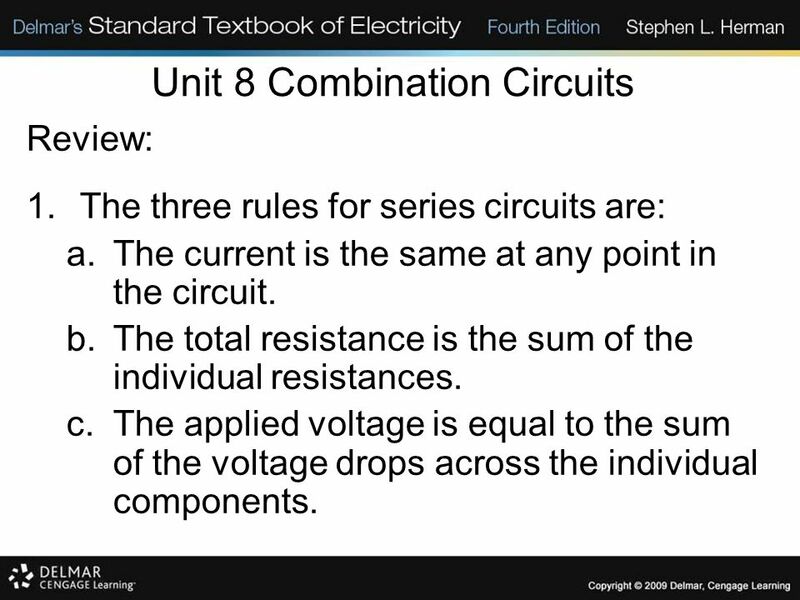 Review: The three rules for series circuits are: The current is the same at any point in the circuit. The total resistance is the sum of the individual resistances. The applied voltage is equal to the sum of the voltage drops across the individual components. 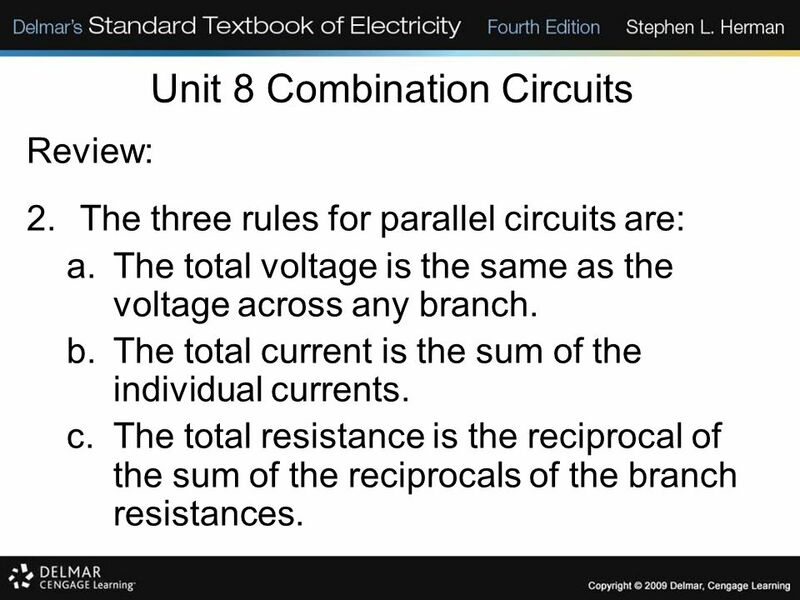 Review: The three rules for parallel circuits are: The total voltage is the same as the voltage across any branch. The total current is the sum of the individual currents. The total resistance is the reciprocal of the sum of the reciprocals of the branch resistances. 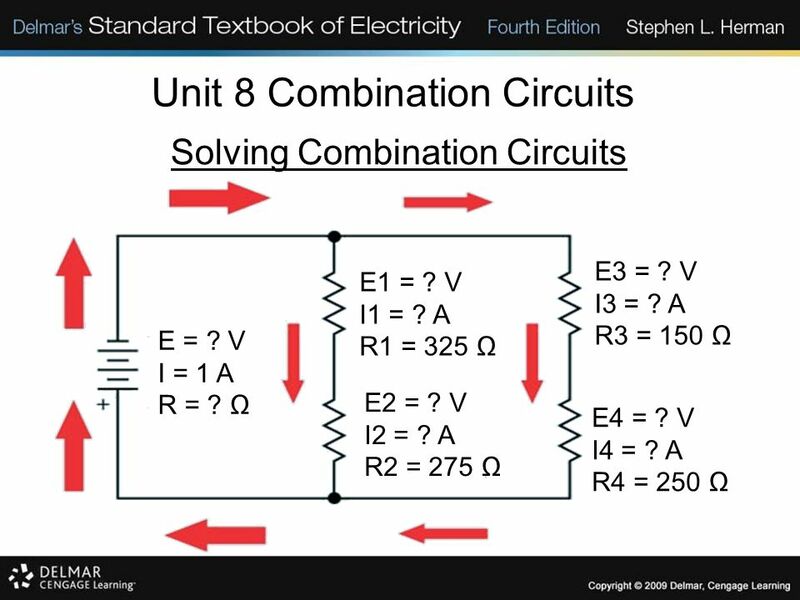 Review: Combination circuits are circuits that contain both series and parallel branches. A node is where three or more paths come together. The total power is the sum of all the circuit resistors’ power. 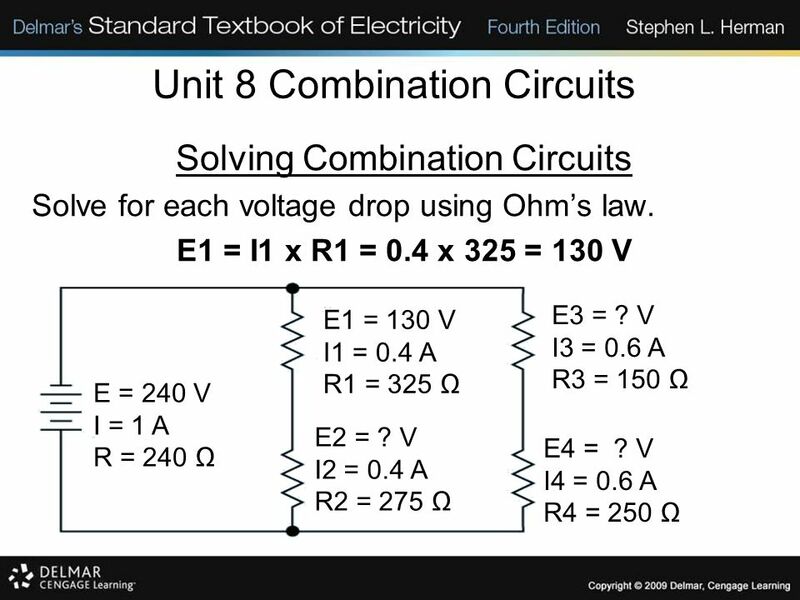 Review: When solving combination circuits, simplify, reduce, and redraw equivalent value circuits. 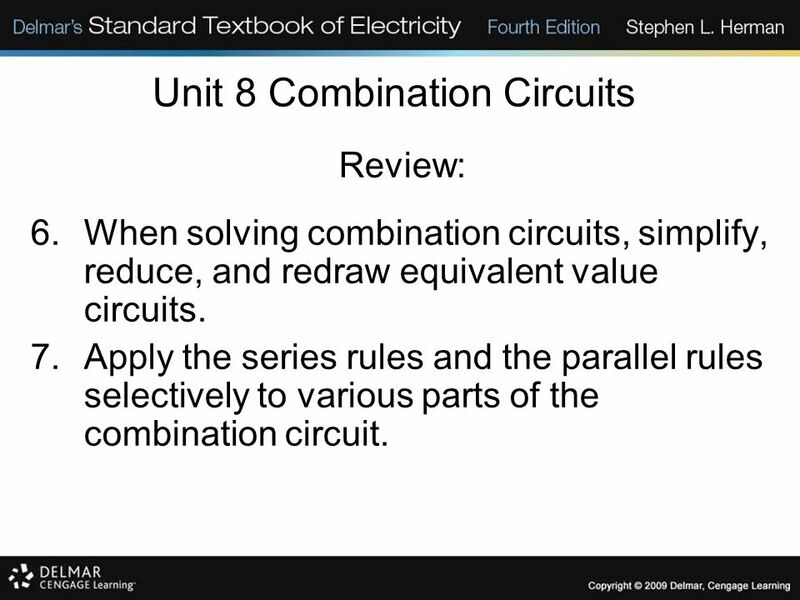 Apply the series rules and the parallel rules selectively to various parts of the combination circuit. 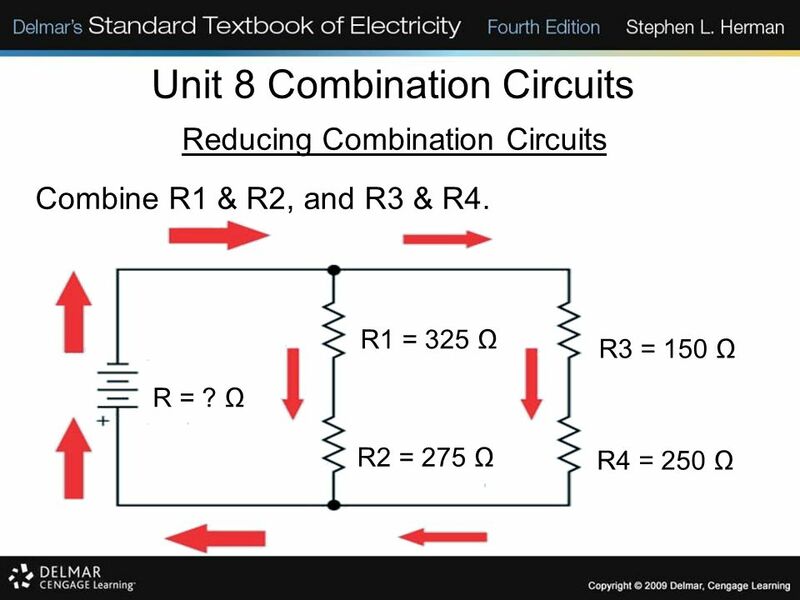 Download ppt "Unit 8 Combination Circuits"
ECE 201 Circuit Theory I1 Resistors in Series Resistors connected at a single node Current through each resistor is the same. 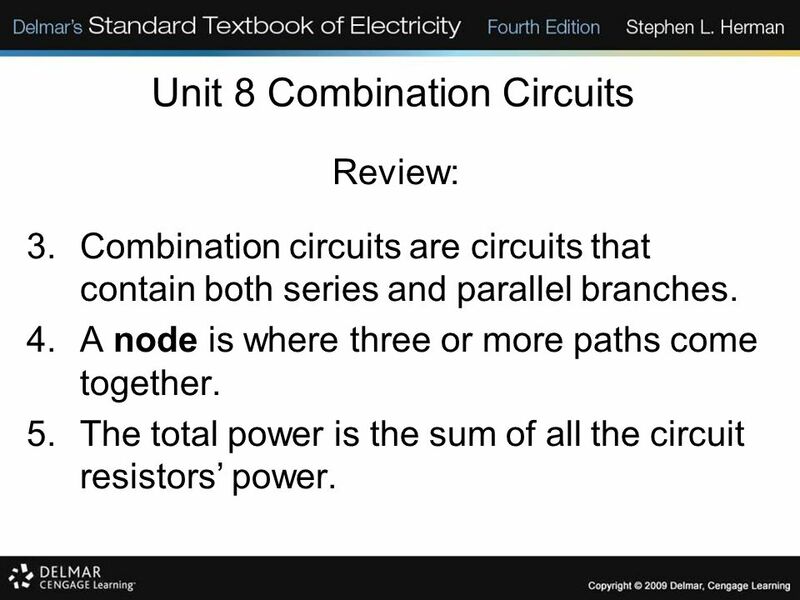 DC CIRCUIT ANALYSIS: NODE AND MESH METHOD Current Sources AND Source Conversions Current Sources in Parallel AND Series Branch-Current Analysis Mesh Analysis. Objective of Lecture Describe what a single node, a distributed node, branch, and loop are. Chapter 2.3 Explain the differences between a series and parallel. 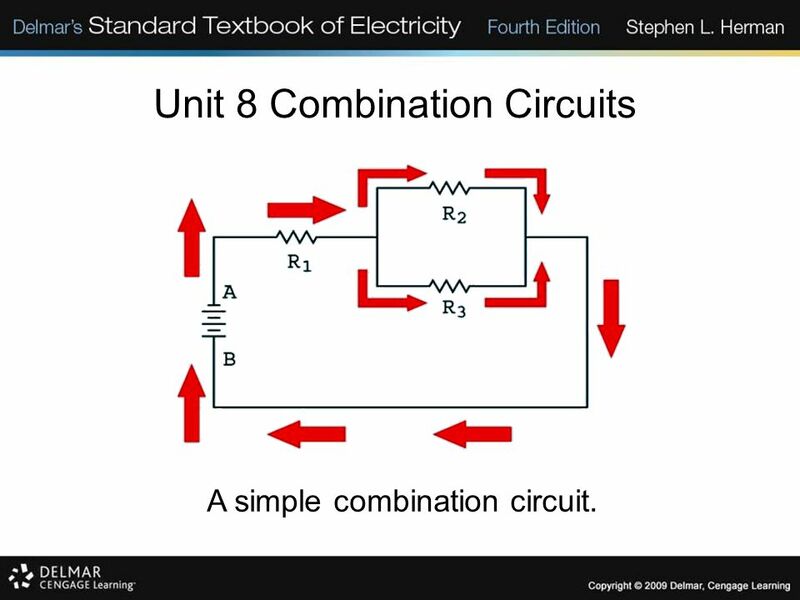 Electric Circuits Electricity for Refrigeration, Heating and Air Conditioning 7th Edition Chapter 3 Electric Circuits. 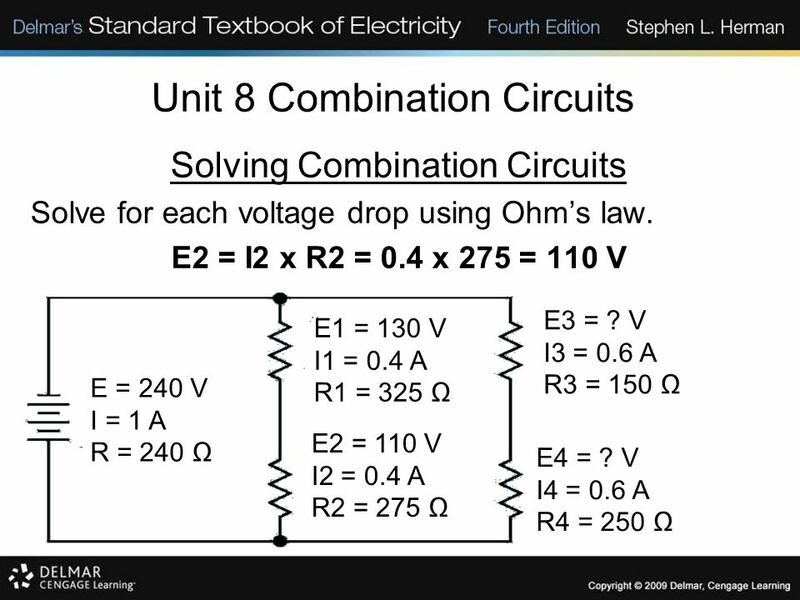 Ohm’s Law Review. Division Review 15 ÷ ÷ ÷ 2.3. 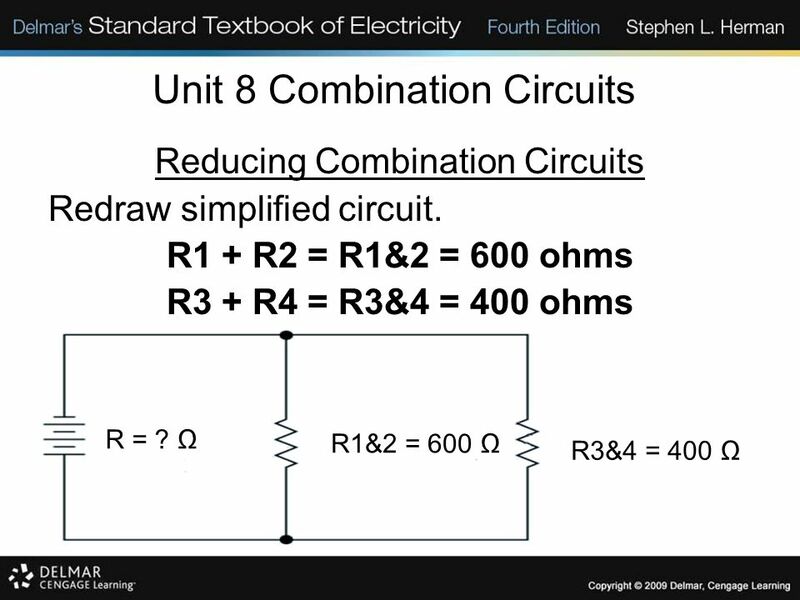 Objective of Lecture Explain mathematically how resistors in series are combined and their equivalent resistance. Chapter 2.5 Explain mathematically how. 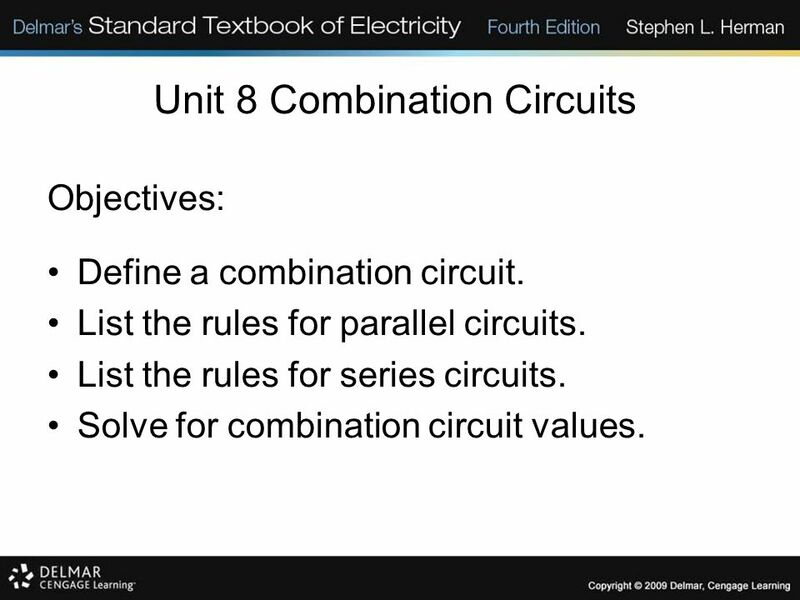 Combined Series and Parallel Circuits Objectives: 1. 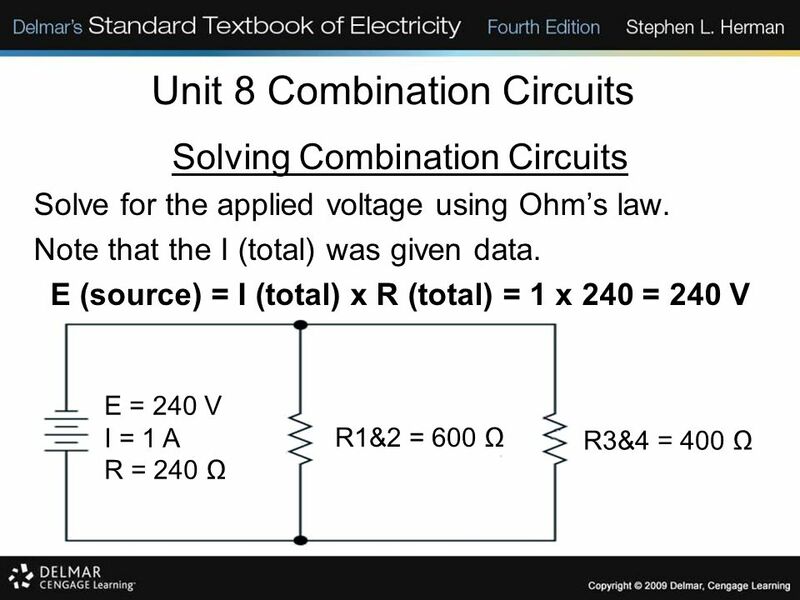 Calculate the equivalent resistance, current, and voltage of series and parallel circuits. 2. Calculate. 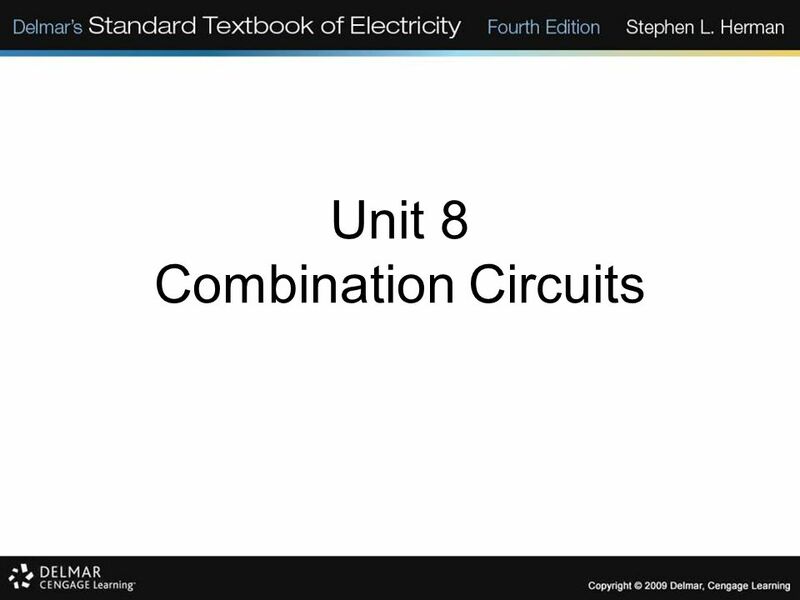 Basic Electronics II Series and Parallel Circuits. Series Circuits AKA Voltage Dividers Cardinal Rules for Series Circuits Potential difference is divided proportionately amongst each of the resistors placed. Kirchhoff’s Laws Laws of Conservation. 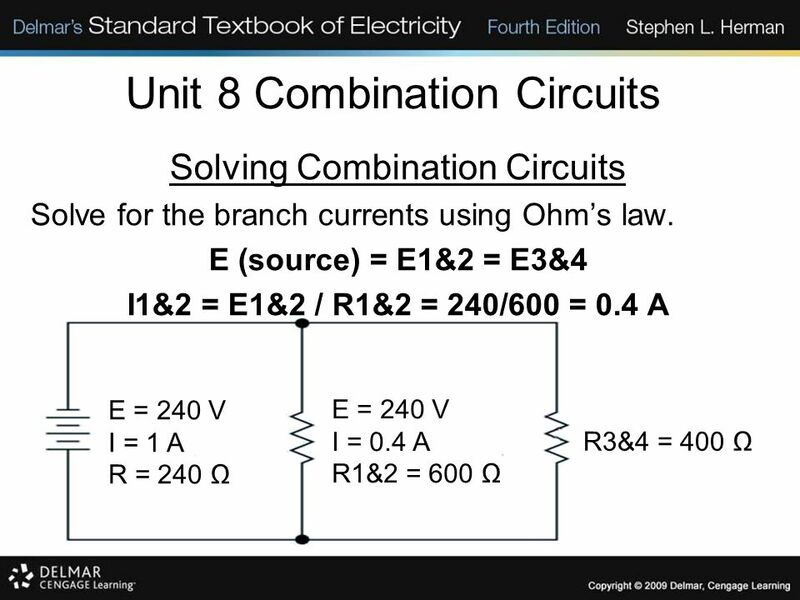 Series Circuits Circuits in which there is only one path for current to flow through All elements of the circuit (resistors, switches etc…) are in the.